Are you looking for some hands-on phonics activities for your students, but you don't have hours to laminate and cut it out? These hands-on, no prep phonics word work cards will save you time and provide students with so many interactive activities! This innovative, digital resource provides differentiated levels! It actually includes, get this, 121 files! I am serious! That is 121 phonics centers that are ready to use with no cutting and laminating! It adds up to 3,400 organized slides (pages) that covers 871 words total! Yup, this paperless resource can be used all year long! This digital word work resource is the version for Google Slides use! I also have a PowerPoint version you can find by clicking here. 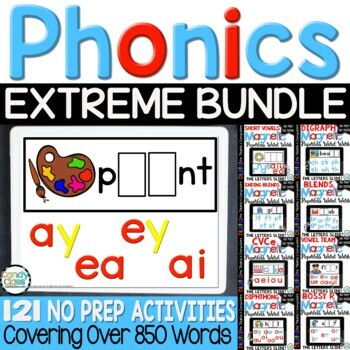 What is included in this Phonics Digital Word Work Extreme Bundle? It includes the following 8 resources for Google use! •A Bonus PDF file with a link to a single, organized spreadsheet that gives you access to all in one spot! •Clear step-by-step teacher directions with screenshots on how to make a copy of the file to your drive, how to assign it in Google Classroom, and how students will access the file. Additionally, I have a FAQ section in the main pdf and my contact information for additional assistance. Did I also mention this resource for phonics can be used on tablets? Say what? Yup, you can use this on a tablet, computer, or you can even project them with a SMARTboard! (SMARTboard use is an option, you don't need it to use this resource if you plan on simply using it on a computer or tablet.) *Tech specs below. Not only that, but this resource stands out from simple phonics games on tablets because it automatically saves their work. That means accessibility to view their phonics work for assessment purposes and more! You are saving a bunch with this Phonics Digital Magnetic Letter Word Work Extreme Bundle! 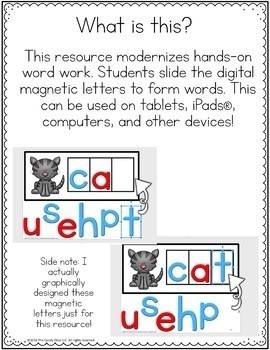 It includes 8 digital word work phonics bundles (listed below)! Those bundles total $64. You save 20% with the bundle! That is like getting some free sets! If you already use Google™ Classroom, you only need to simply assign students a file and you are set! It is simple like handing them a sheet of paper! 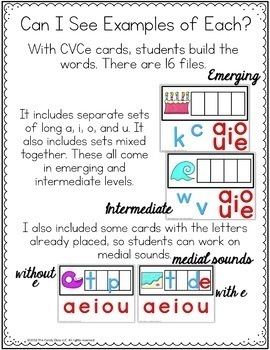 I have broken these down into chewable chunks of 12-48 word work cards per a file and there is plenty to choose from for differentiating your phonics instruction too! •Kids love using technology. It's engaging, phonics activities! •It is still hands-on like a real word work card with magnetic letters. They still have to slide those letters on that card for developing their phonics skills. •All the letters are ALREADY organized! No messing with a bunch of letters in smeared, labeled baggies. This makes it so much easier for differentiating your phonics instruction without having to do a thing, except assign the appropriate file to each student! Easy, simple, bam! Now, that is what I am talking about! What about differentiation? For emerging, I paired letters together such as bl, ay, ow, etc. For intermediate levels, I upped the challenge by only providing individual letters that the students will need to pair together. For students who need even more challenge, they can type a sentence with the word on the slide. ***There are some technical requirements to use this phonics resource. First off, this resource is in Google™ Slides format, so you will need to access to that software to use this resource. For teacher led instruction such as using a SmartBoard for whole instruction or a tablet while working with a small group, you can use Google Drive to access Google Slides. Google Drive is free to set-up with an email account. However, there are age restrictions with setting up an email. If you want students working in their own accounts/projects, you are going to need Google Classroom to access Google Slides. This resource is free too, but at this time, it is only available to non-profit educational institutions and you will need to get your school on board with it. If you don't have Google Classroom, please get with your tech department to set this up before purchasing this resource. You will also need internet access to use this resource. 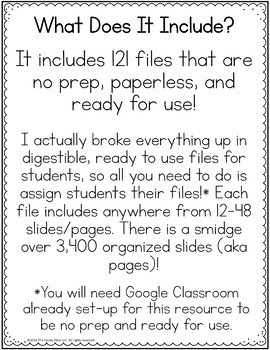 This resource is only no prep to those who already have Google Drive or Google Classroom set-up. For more details about this resource for phonics, please view the preview by clicking on the button under the picture that says preview. It breaks everything down more clearly. If you are having trouble viewing the preview, feel free to contact me at teachcandyclass@gmail.com. I will be glad to send you a copy of the preview. Please note, this paperless resource is for personal, classroom use only. Also, I am not affiliated or associated with Google, nor do they endorse this resource. This resource for phonics is simply a resource that can be used with their software/apps.